We've covered Netgear's Arlo products on the site for a while. Back in January, Ryan reviewed the original Arlo Pro, and he came away mostly impressed. Now you can get the Arlo Pro with one camera for $50 off, and the Pro with two cameras for $70 off. 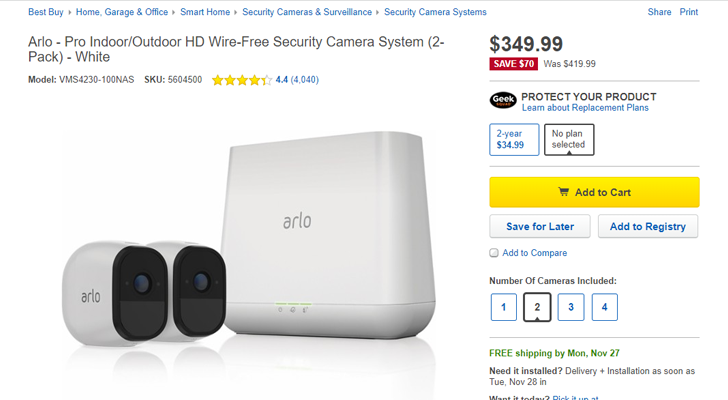 If you're not familiar with it, the Arlo Pro is a completely wireless home security solution. Each camera has a 720p 130-degree lens with infrared night vision, weather resistance, and motion detection. They should last for months on a single charge too, so you don't have to worry about constantly replacing the batteries. Netgear will keep seven days of motion and/or audio triggered recordings in the cloud for free, and you can even connect a USB drive to the base station for local storage. Keep in mind that these are original Arlo Pro cameras, so they are 720p, as opposed to the newer 1080p ones. You can find the discounted kits at the links below.